On the event of Eid-ul-Azha ,meat was distributed among the orphans,widow and needy people in different parts of country such as Skardu ,Gilgit ,Quetta ,Muzaffarabad , Muzzafargarh ,Haripur ,Rawalpindi. Khubaib Foundation performed Qurbani for Flood effectees, orphans, prisoners, widows, needy and destitute people across Qurban program stretched over three days and from Giligit Balitistan to Sindh and Punjab KPK. 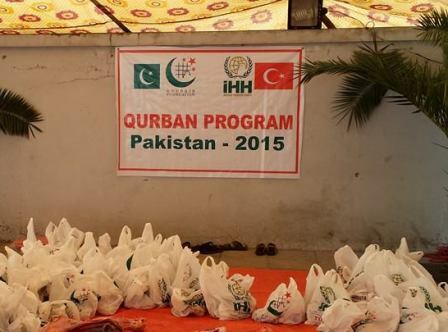 Turkish delegation visited different projects with Khubaib Foundation to celebrate the happiness of Eid Qurban with less privileged segment of society. Qurban was performed in these cities of Pakistan Skardu, Jhang, Sargodha, Rara Muzafarabad (AJ&K), Attock jail, Quetta, Mansehra, Adyala Jail, Rawalpindi, Islamabad (Slum areas) including all educational projects of Khubaib Foundation. Khubaib Foundation performed Qurbani for Flood effectees, orphans, prisoners, widows, needy and destitute people across Pakistan in 25 cities, towns and places keeping its tradition since 1999. Qurban program stretched over three days and from Giligit Balitistan to Sindh and Punjab with over 4000 beneficiary families. A 14 member,Turkish delegation visited different projects with Khubaib Foundation to celebrate the happiness of Eid Qurban with less privileged segment of society. 3 camels were also sacrificed at Head office, Islamabad. Qurban Program was covered my major outlets of Print and Electronic media. Khubaib Foundation also arranged a dinner on Eid Day at International Islamic University, Islamabad where International students from Islamic countries and their families were invited. About 800 students attended and 80 families were provided with meat. Qurban was performed at the Flood area of Gujrat, Jhang, Sargodha , Rara Muzafarabad (AJ&K), Muzafargarh, Bakhuwala,Rawalpindi, Islamabad (Slum areas).